In the 36th Congressional race, challenger Marcy Winograd wins the endorsement of the influential West Los Angeles Democratic Club over six-term incumbent, Jane Harman, by a nearly 3-1 margin!!! 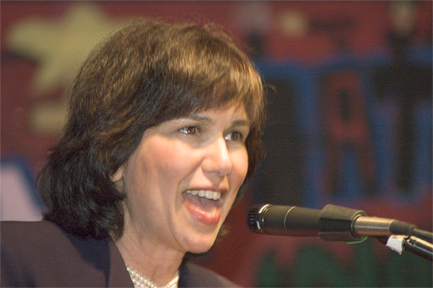 VENICE, CA - May 30, 2006 -- The grassroots will be taking back the soul of the Democratic Party in California's 36th Congressional District if peace activist, Marcy Winograd, has anything to say about it. In a stunning blow to incumbent Jane Harman, Winograd swept the voting of members of the influential West Los Angeles Democratic Club, 54-19. Promising to support single payer health care as well as the impeachment of both Bush and Cheney, Winograd was the clear favorite as the crowd cheered and gave her a standing ovation at the Venice Center for Peace with Justice. Venice resident Harman, who had refused to attend the event if in a debate format, spoke first, laying the groundwork for Winograd's withering attack on Harman's record of complicity with the Bush administration agenda. 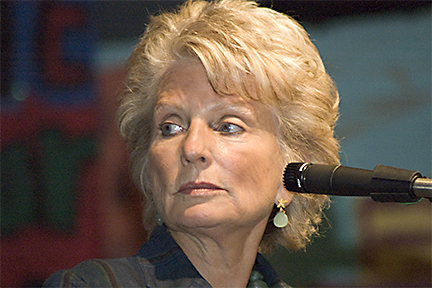 Harman left the auditorium, however, immediately after her presentation and did not witness the overwhelmingly positive crowd support for Winograd, whose endorsements include the United Farm Workers and United Teachers of Los Angeles. Winograd's campaign has become the focus of national attention as one of the target races of the Progressive Democrats of Ameria. Winograd has served as the president of the Los Angeles chapter of PDA and was named "Democrat of the Year." She leads the Media Reform Committee of the CA Progressive Caucus and is the host of their public access show, "They Say/We Say." Harman, speaking first during the WLADC Candidates' Forum, responds to questioning of her record on Iraq and her prior knowledge and silence about the NSA warrantless spying on Americans.